[266 Pages Report] The global clinical trial management system market is expected to reach USD 1,065.6 million by 2022 from USD 590.0 million in 2017, at a CAGR of 12.6%. Factors such as significant partnerships between biopharma companies and CROs, rising number of clinical trials, availability of advanced CTMS solutions, growing customer base for CTMS solutions, and rising government funding & grants to support clinical trials are driving the overall demand for CTMS across key markets. 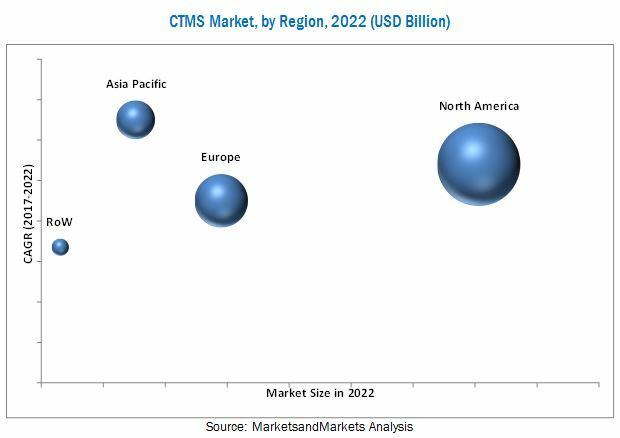 However, budget constraints and limited awareness among researchers about the advantages of CTMS solutions are the major factors restraining the growth of CTMS market. Rising number of clinical trials and significant partnerships between biopharma companies and CROs are the major drivers for the market. The life science industry is witnessing a global increase in the number of clinical trials each year. This growth in the number of clinical trials conducted can be attributed to factors such as the rapidly increasing aging population, high prevalence of chronic diseases, expiry of blockbuster drugs, availability of government funds for clinical trials, and fierce competition in the pharmaceutical industry. According to ClinicalTrials.gov, as of December 06, 2017, 260,848 clinical trials were registered across the globe. As CTMS solutions are predominantly used to manage clinical trials, the global rise in the number of clinical trials is directly contributing to the increase in the demand for CTMS solutions. Currently, factors such as the impending patent cliff and the expiry of major drugs, rising drug development costs, increasing regulatory and reimbursement issues, and a sluggish global economy have put enormous pressure on the biopharmaceutical industry. In order to remain competitive in the market, many market players are increasingly outsourcing their clinical trials to CROs to reduce the cost and time of the entire process, improve their global reach, and extend their expertise. Clinical trial management systems are used to effectively and efficiently manage clinical trials by streamlining patient management, project management, and data management. Thus, growing partnerships between biopharma companies and CROs is also expected increase the adoption of these systems in the coming years. To define, describe, segment, and forecast the global clinical trial management systems market on the basis of components, type, delivery mode, end user, and region. 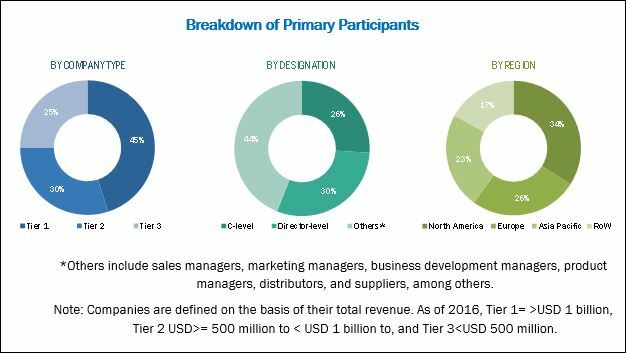 During this research study, major players operating in the clinical trial management systems market in various regions have been identified, and their offerings, regional presence, and distribution channels have been analyzed through in-depth discussions. Top-down and bottom-up approaches have been used to determine the overall market size. Sizes of the other individual markets have been estimated using the percentage splits obtained through secondary sources such as Hoovers, Bloomberg BusinessWeek, and Factiva, along with primary respondents. The entire procedure includes the study of the annual and financial reports of the top market players and extensive interviews with industry experts such as CEOs, VPs, directors, and marketing executives for key insights (both qualitative and quantitative) pertaining to the market. The figure below shows the breakdown of the primaries on the basis of the company type, designation, and region considered during the research study. Major players in clinical trial management systems market include Oracle Corporation (US), Medidata Solutions, Inc. (US), PAREXEL International Corporation. (US), Bioclinica. (US), Bio-Optronics, Inc. (US), and IBM (US). Product launches, partnerships, collaborations, agreements, and market expansions were the key strategies adopted by players to grow and expand their presence in the clinical trial management system market. In October 2017, MedNet Solutions released the latest version of iMedNet with enhanced features. In May 2017, Oracle opened its Oracle Cloud EU Region in Germany, with the addition of modern infrastructure as a service (IaaS) architecture and new IaaS and platform as a service (PaaS) cloud services. In September 2017, Pamplona completed the acquisition of Paraxel and bought its shares in order to help PARAXEL increase its productivity. The global clinical trial management system market is expected to reach USD 1,065.6 million by 2022 from USD 590.0 million in 2017, at a CAGR of 12.6%. Factors such as significant outsourcing of clinical trial research to CROs, rising number of clinical trials, availability of advanced CTMS solutions, and rising government funds & grants to support clinical trials are driving the overall demand for CTMS across key markets. A clinical trial management system (CTMS) is a software system used to manage clinical trials. It streamlines the clinical trial process and optimizes operational efficiency. This helps reduce the overall cost of conducting clinical trials. CTMS assist companies that conduct clinical trials such as CROs; medical device, pharmaceutical and biotechnology companies to plan, track, and manage clinical trials and their progress. On the basis of by type, the clinical trial management systems market is segmented into enterprise CTMS and site CTMS. The enterprise CTMS segment is expected to command the largest share of the global clinical trial management system market in 2017, and is expected to grow at the highest CAGR in the forecast period. This is attributed to the global adoption of enterprise CTMS by majority of the end users. On the basis of delivery mode, the global CTMS market is segmented into web-based (on-demand), licensed enterprise (on premise), and cloud-based (SaaS) segments. The web-based CTMS expected to command the largest share of the global market in 2017. This is attributed to benefits provided by the web-based CTMS solution such as improves quality of clinical trials, productivity and timelines, ease of access that enables faster transfer of data and easier co-relative studies and reduced cost offered than other products. By end user, the clinical trial management systems market is segmented into pharmaceutical and biopharmaceutical companies, contract research organizations, medical device companies, and others. The pharmaceutical and biopharmaceutical companies segment is sub segmented into large pharmaceutical companies and mid-small pharmaceutical companies. The pharmaceutical and biopharmaceutical companies segment is expected to account for the largest share of the CTMS market in 2017. The largest share is attributed to the increasing adoption of CTMS software during drug clinical trials by pharmaceutical and biopharmaceutical companies. North America is expected to dominate the global clinical trial management systems market primarily due to the high number of ongoing clinical trials, rising government support for conducting clinical trials, and presence of a large customer base in this region. However, Asia Pacific is expected to register the highest growth rate during the forecast period. Factors driving growth in the APAC region include the increasing outsourcing of clinical trials, availability of a large and diverse patient population, presence of supportive regulatory guidelines for clinical trials (as compared to developed nations), and cost advantages offered by countries in the region. Contract Research Organizations form the fastest growing end user segment. Pharmaceutical and biopharmaceutical companies are major end users of CTMS. Life science companies primarily utilize CTMS software solutions to manage clinical trials for newly developed drugs. The large market share of these companies is attributed to factors such as increasing applications of CTMS software in clinical trials for drugs and high investments by large pharma and biopharma companies for the development of healthcare IT software. A contract research organization (CRO) is an establishment that provides support to the pharmaceutical, biotechnology, and medical device industries in the form of research services outsourced on a contract basis. Research services include biopharmaceutical development, biologic assay development, commercialization, preclinical research, clinical research, clinical trials management, and pharmacovigilance. Rise in outsourcing of clinical trials by pharma and biotechnology companies to CROs is the key factor propelling the growth of this segment. In the past five years, the industry has witnessed a number of strategic alliances between contract research organizations and drug manufacturers. Medical device companies use CTMS software solutions to manage clinical trials related to medical devices. Advancements in medical devices and their therapeutic capabilities and increasing stringency of regulatory approval bodies are driving the growth of this end-user segment in the clinical trial management system market. Government funding for development of innovative medical devices is also contributing to the rising demand for CTMS solutions among medical device companies. The other end users segment includes hospitals and academic research institutes. Hospitals use CTMS solutions to manage their multiple active clinical research studies, patient tracking, improve recruitment and financial performance, and streamline data collection and reporting. Increasing IT budgets of hospitals is likely to drive the demand for the CTMS solutions. Increasing public and private funding to support research activities by academic institutions is a prime factor contributing to the growth of the CTMS market in this segment. Which of the end user segments would be driving the market growth during next decade for these software solutions; especially in Emerging countries? Emerging countries have immense opportunities for the growth of web-based (on-demand) segment, will this scenario continue? The enterprise-wise CTMS segment is expected to command the largest share across matured countries; how relevant On-Site CTMS solutions would be with changing user preferences? By how much is the clinical trial data management software segment larger than the services segment during 2017-2022? Although R&D spending in the life science industry is on the rise, start-ups and small-to-medium-sized enterprises (SMEs) still face budget constraints, which affect their decision to purchase CTMS solutions. Also, due to uncertainties in product approvals, undue delays in product approvals, and long gestation periods, private investors usually prefer established firms to invest in over start-ups and SMEs. Owing to this, SMEs often have to partner with big pharma companies, raise venture capital, or rely on government grants or initial capital from angel investors. Pharmaceutical or biotech start-ups require infrastructure, such as laboratories and manufacturing facilities, which account for the maximum amount of the funds raised. This, however, leads to insufficient funds for other activities such as R&D and clinical trials. Software such as CTMS and CDMS are expensive, and require huge investments for their implementation. A CTMS solution typically includes added costs for implementation and setup, software updates, support, maintenance, and training. The cost of subscribing for CTMS solutions could run up to USD 1,500 to USD 3,000 per month. Thus, the high cost of CTMS and limited financial budgets act as barriers to its adoption among end users. Key players in the clinical trial management systems market include Oracle Corporation (US); Medidata Solutions, Inc. (US); PAREXEL International Corporation, (US); Bioclinica, (US); Bio-Optronics, Inc. (US); and IBM (US); among others. *Top 15 Companies Analyzed for This Studies are - Oracle (US), Medidata Solutions (US), Parexel (US), Bioclinica (US), Bio-Optronics (US), IBM (US), Datatrak (US), Veeva Systems (US), DSG (US), Mastercontrol (US), ERT (US), Forte Research Systems (US), Mednet Solutions (US), Arisglobal (US), and DZS Software Solutions (US).